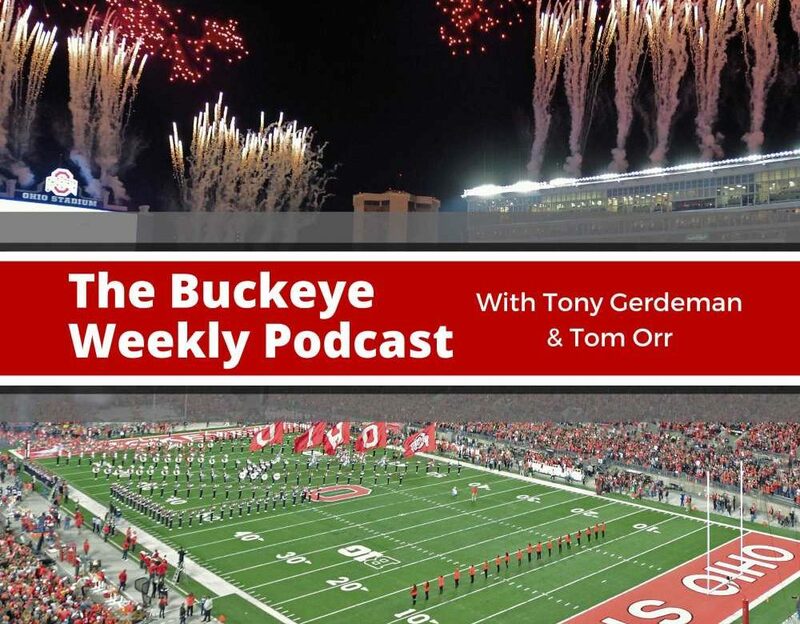 In this episode of the Buckeye Weekly podcast, Tony Gerdeman and Tom Orr talk Buckeye spring practice. The receivers and secondary were the topics of the day, including discussions of freshman receivers Garrett Wilson and Jaelen Gill. The secondary is also discussed following conversations with coaches. We know more now than we did a couple of weeks ago about the defense, but it has only created more questions. All of this and much, much more, including a wrap up of the Buckeye basketball season. + Welcome from the satellite studio on location. + Tom recaps the practice that we didn’t get to see. + We are learning more and being told more. + Brian Hartline wanted Kamryn Babb on the field this year, so this is a blow. + Both injuries are terribly unfortunate given their respective careers at OSU. + Hilliard embraced his role as special teams leader. + OSU’s therapy staff is pretty dang good. + Does there come a point when a player simply wants to quit? + Johnnie Dixon almost did it. + Other various dings and nicks that aren’t serious. + We’ve all returned from spring break a little worse for wear. + There are so many different players running with the ones right now. + Austin Mack moves to Z. + Gets OSU’s three best receivers on the field. + Mack makes the Zs older and more experienced. + Takes weight off of Garrett Wilson to make an impact immediately. + No surprise if Wilson is in that top six right away, however. + This is also made possible by the improvement in Jaylen Harris. + Garrett Wilson is impressive every time we see him and it feels like we talk about him a lot. + He doesn’t look like a freshman in anyway and he doesn’t look like a normal receiver in most ways. + Tom raves about Wilson. + We know about building the hype on players and how fans can hate it. When it comes to Garrett Wilson, we don’t care. + Everything Wilson does catches your eye. + Don’t put too many statistical expectations on him this year, however. + Now let’s move on to Jaelen Gill. + He’s always making plays, and doing it all over the field. + Again, don’t put too many expectations numbers-wise on him. + They remind Tony of the David Boston, Mike Wiley impact. + Jaylen Harris looked good on Saturday just like he did last spring and last year it led to two catches. + It’s tough for young guys to produce in deep rooms. + KJ Hill is the forgotten man and he really shouldn’t be. + Four good minutes on KJ. + What is the difference between the free safety and strong safety this year and who is playing where? + More answers lead to more questions. + Sometimes it’s a one-high safety, then in nickel (which is actually dime) it’s two high (including Brendon White at safety) with Shaun Wade in the slot? + Who fits best in the deep safety role? + Josh Proctor is one to watch. + We had Brendon White playing the hybrid spot months ago. + White says it’s not easy doing what he’s doing, but he’s excited about his new role. + He’s also excited about not having to move to a new position after this. + These guys are going to look back for the ball. + They didn’t start focusing on that last year until after the Tulane. + AFTER THE TULANE GAME?!? + Tom thinks there may have been some schematic issues with the Ohio State defense last year. + Buckeyes will be playing more zone this year. + The intent is to disguise coverages, and also keeps the eyes on the ball. + Their hands were tied when it was handed down from on high that the Buckeyes could only be a press man team. + Justin Fields loses his black stripe. + If Justin Fields was going to win the job this season, this is a lot how the spring would look. + If Fields is already even, is that a bad sign for Matthew Baldwin? + There is more read option coming if Fields wins the job and that is a good thing. + Fields as a runner is in the middle of Braxton, Terrelle, Troy, and JT. + If we’re confused by this defense, just imagine how opposing quarterbacks feel. + There are so many variables to this defense. + We’re close to having answers. + By the middle of September we should have a pretty good feel for what this defense looks like. + We’re more well-read than we were before. + Motivation isn’t needed for The Game. + Hackers infiltrated the Woody. + Almost certainly the Chinese. + Ohio State finally has a head coach who is focused on Michigan! + Wrapping up the basketball season, which was a success given the roster. + What coaches could have done more with this team? + What’s the goal for next year?